Wow, doing the math for this one really brought home that its true that the price of produce is going up, and the price of meat is coming down! I’m kind of shocked that we spent almost twice as much on (admittedly out of season) zucchini as we did on chicken. Anyway, this is a great, flavorful dish that, though loaded with veggies, has enough in common with mac-n-cheese and other casseroles to satisfy comfort food cravings (and who isn't having those these days?). 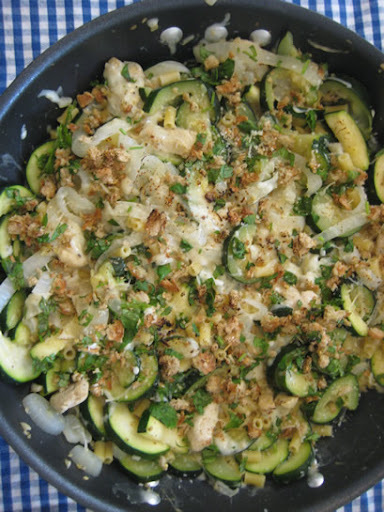 Cut the zucchini in half lengthwise, then into ¼ inch thick slices. 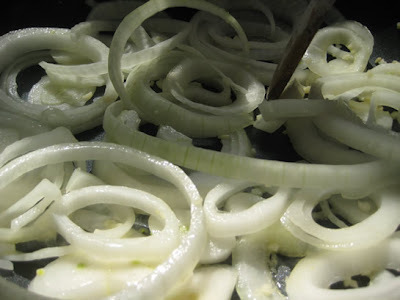 Slice the onion into ¼ inch slices, and mince the garlic. Bring the chicken broth and one clove of garlic to a boil in a medium saucepan. Add pasta and cook until al dente, per package directions (approx. 8 minutes). While pasta cooks, grate the swiss and mozzarella. (If you have sliced swiss instead of a hunk, just cut into small pieces.) Cut the chicken into 1/3 inch-wide slices. Add the zucchini, oregano, several grinds of pepper, a dash of salt and cook until the zucchini begins to soften, about 3 minutes. If you’ve got a really enormous skillet like we do, scoot the vegetables off to the sides of the skillet and add chicken into the center. Continue cooking approximately 5 more minutes, until the chicken is just cooked through. If you have a smaller skillet, cook the vegetables until cooked through, and transfer to plate. Then throw a little more oil into the skillet, warm, and stir-fry the chicken approximately 3 minutes until just cooked. Then return the vegetables to the skillet. Add the cooked pasta with the cooking liquid, grated swiss and mozzarella, and stir well to combine. In a small bowl, combine parmesan cheese, breadcrumbs, and parsley (if using.) Sprinkle breadcrumb mixture over top of dish. Broil until golden, approximately 3 to 5 minutes. Alternate directions for those without broilers: We have a broiler, but its very narrow and not deep enough to broil anything without instantly setting it on fire. What we do have, however, is a Crème Brulee torch! (Only in NYC, right?) Here’s what we do: After combining the cheeses, leave the dish on the stove for a few more minutes, while stirring gently. Then sprinkle the breadcrumb mixture across the top and break out the torch! Move the flame slowly and continuously across the top of the gratin, until the top browns. * Whole grain can be hard to find in these shapes, so we ended up using regular pasta this time. Both work if you can find them (and like whole grain pasta). ** You can get this from the deli counter. If you live in NYC, the guy behind the counter will grumble about cutting off such a small portion, but will do it anyway. I’m guessing that if you live elsewhere, he’ll do it and tell you to have a nice day. Either way, you’ll pay less than you would have for a larger pre-packed quantity of swiss cheese, which you’d then have to use up. *** We keep this in the freezer and it lasts for several months. **** What we do for breadcrumbs is save the crusts from whole wheat bread, throw them into the food processor, then freeze. Healthier, tastier, and cheaper than the overpriced cartons of sawdust-like material you find at the grocery store. ***** We consider parsley to be a staple b/c we grow it in a herb pot. Some herbs work better than others in pots, but we’ve had great success with parsley on the window sill. Rosemary has turned out fantastically for us, but cilantro and basil were both a disaster. Have you tried this? What works for you? Any tips? Please share in the comments! Ooooh...never tried homegrown cilantro. Sad to hear it´s difficult to grow, and with my back thumb, it´s probably impossible, but my tastebuds are screaming for me to try! Love the idea of using a creme brulee torch as a boiler. Ours is also small and narrow. Great tip. If you move out to B'lyn you can join the Food Coop. The prices are generally fantastic, especially on organic produce. But they have higher quality food, so there's not as huge of a difference on a lot of things. Cheap organic pasta still costs more than regular pasta, y'know? Thanks Anne, glad you liked it! If you try it, let me know how it goes! Hi there - I always get so many zucchini from the CSA (which thankfully is starting up again soon) - I'm adding this to the arsenal of recipes to try. Ok so we cooked the chicken/zucchini gratin for dinner. Actually, I cooked which made G very happy :-). I found it comforting yet not cloying. I sauteed the garlic before adding the onions, and browned the garlic almost too well, but I think it added some depth to the flavor. I read it as "cut onion into 1/4," then saute it, and I see from the picture that it should be 1/4 inch which would work much better. 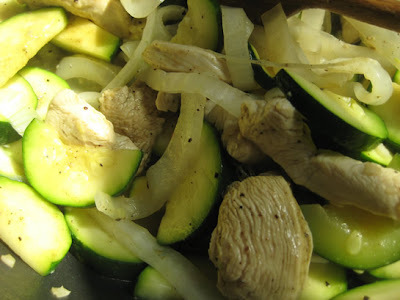 We used orzo, with the chicken, zucchini etc, which was tasty and satisfying. Another bonus is that we will get two meals out of this. P.S. I hope we didn't overanalyze a comfort dish! Thanks Kevin! If you make it, let us know how it turns out! I have such a hard time getting my honey to eat zucchini, I'm definitely going to give this recipe a try!